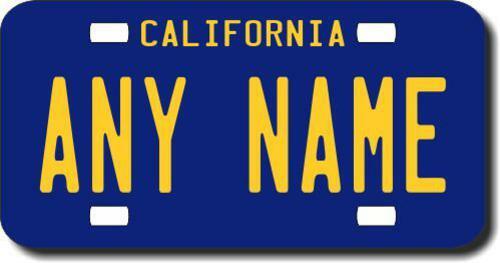 Resembles California State License Plate. We make it custom with any name you want. You specify the name on the plate and your custom plate is made to order. Any Name. No Problem. Never search the rack again for a name they didn't make. These license plates make a great gift. There are many uses. Some custom plates you find online are made from decals that can crack and peel or be torn off. We do not use decals. We use a special printing process to print a flat design directly to the surface of the plate. The image becomes a �permanent part of the plate itself and will not crack or peel off. Please Note: These plates are novelty vanity plates. These plates are not officially issued registration plates issued by your State government and are not intended to replace the official registrations plates on your motor vehicle. 3" x 6" Aluminum: This is a .025 thick aluminum blank with a full color imprint on the plate. The plate has 2 holes pre-cut in the top side of the plate only. This size is great for bikes, bicycles, ATVs, scooters, walkers, golf carts and even for use as a sign on kid's room doors or on workplace cubicles. Many uses. 4" x 7" Aluminum: This is a .025 thick aluminum blank with a full color imprint on the plate. The plate has 2 holes pre-cut in the top side of the plate only. This size is great for bikes, bicycles, ATVs, scooters, walkers, golf carts, motorcycles and even for use as a sign on kid's room doors or on workplace cubicles. Many uses. Not for official use. 1.5" X 3" Keyring: This is a heavy duty, sturdy, rigid fiberglass reinforced plastic plate printed in full color on 1 side. Comes with metal split ring keyring and connector.